A lot has happened since my last tank update. Basically something has changed in every single tank. Most of the changes have been for the better. This will probably be my last tank update of the year as I'll have to wait until after Christmas to add any more fish because we will be leaving on vacation. I don't like to have fish in QT while I'm away. I bought a new goldfish buddy for my remaining ryukin. She went through a 3 week QT just fine, and they are now swimming together in the large 55 gal. 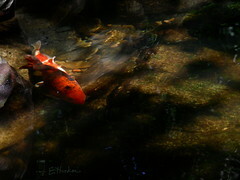 I've seen the breeding tubercules on the ryukin, but I don't see them on the new redcap oranda. And I've seen the ryukin nudging the oranda's vent. I've come to the conclusion that the new goldfish is a girl. I'd really rather have all males to avoid the breeding issue, but it's done and over with. 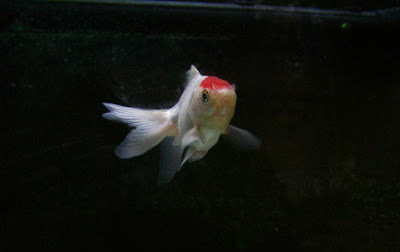 Plus, my new oranda is just precious and outgoing as ever! How could I not love her? Burbbles and Magikarp playing together. It's so hard to get them both in focus. My 29 gal community has undergone the most changes. I added a new large piece of driftwood that I ordered from Aquariumplants.com as well as about 2 more species of plants. I've added green tiger lotus (Nymphaea lotus) and Cryptocoryne undulata. I ordered them from PetsWarehouse.com, and I can't say I'm too pleased with the packaging. The plants weren't protected very well; there was no padding and the plants were just in plastic bags. The box was visibly crumbled, and some of the plants look damaged. It remains to be seen if they will recover. Anyway, this complete the aquascape and hardscape. I'm going to let these plants establish for about a month before I begin stocking the fish. I still haven't decided on a final stocking plan, but I do know I will have a tetra species, a gourami species, and a twig catfish (Farlowella spp). but the lotus is that large reddish leaf in the center. Since I have written you, I've lost one of my bettas, Knucker. He was my oldest and had the worst health due to inbreeding. During his last months I noticed he lost control of swim bladder and could not maintain neutral buoyancy, a problem common in double-tail bettas. While not a double-tail himself, I believe he carried the genes as I saw a lot of bad hallmarks of the double-tail like scoop head, a huge dorsal, and massive fins. I placed him in a breeder box in the 29 gal. I returned from a Thanksgiving vacation to find him dead, but I take heart in knowing that I gave him the best care and he probably wouldn't have gotten the same if another person had picked him up from the shelf. Goodbye, Knucker. The picture on the left is from when I first bought him. The last major change I made was for the plants. I've noticed rather stalled growth in many of my plants. I dose weekly with micronutrients using Seachem Comprehensive, but I still didn't get good growth. After a little research I figured out it is because my water is so soft. I started adding Seachem Equilibrium to raise the GH up to about 6 in each of my softwater tanks. I use it to raise the GH to around 10 in my goldfish tank as they are hardwater fishes. As of right now I haven't seen a large increase in plant health, but I didn't expect it so soon as I've only been using Equilibrium for two weeks now.